Today was our embryo transfer day! I slept pretty well given my nerves. I slept horribly Friday night so that is most likely the reason. At any rate, we were due at the IVF center at 10 with transfer scheduled at 11. Let me tell you, that was the longest hour ever! Per their instructions, I took the Valium I was prescribed once we arrived. I probably should have taken it earlier, though, since it didn't really kick in until after the whole thing was over, so I was a nervous wreck throughout. 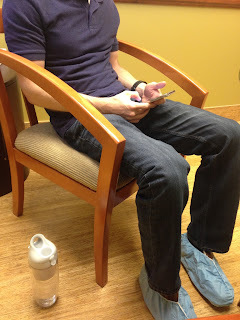 The doctor attempted to soothe me by saying it wouldn't be painful and would be over quickly, but it was more the realization that "THIS IS IT", the culmination of the whole physically, emotionally, and financially draining process, that had me on edge. 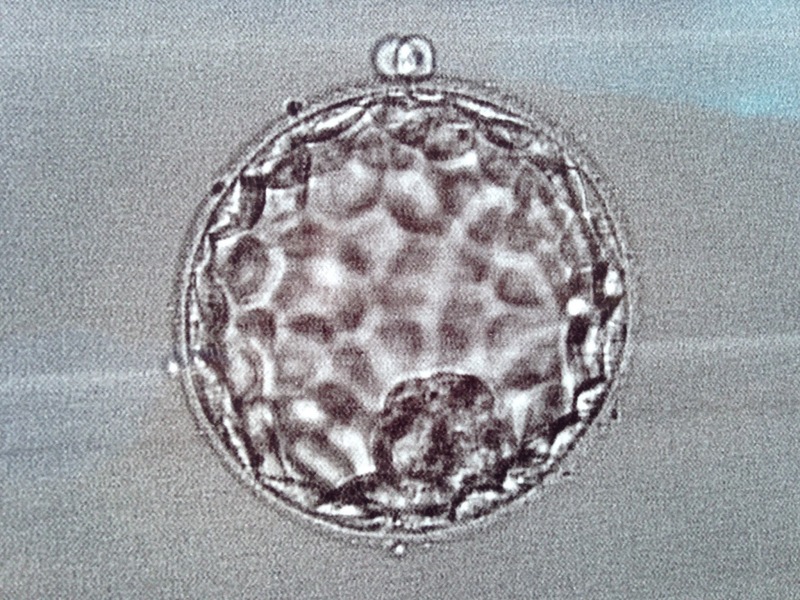 Before the transfer began, the embryologist came in to give us a progress report on our embryos and to tell us how many they would be transferring. I had thought earlier that we would be called during the week and given an update, but I was mistaken, so this was the first we had heard anything since our egg retrieval. Out of 28 eggs, 22 were mature, 20 fertilized, and 4-5 were perfect. She is watching the others for one more day and she expects 3-4 more to be at a stage where they can be frozen. So that will be a total of 4-8 frozen. 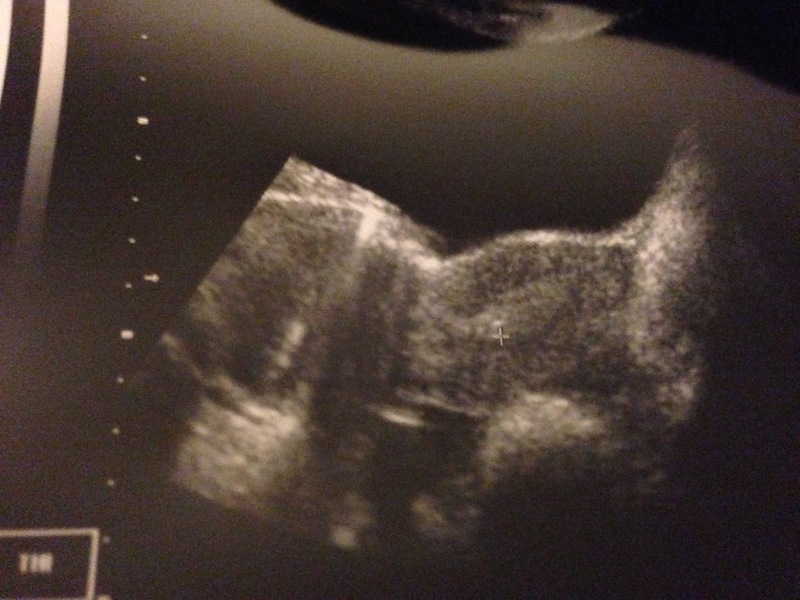 And here, without further ado, is our single perfect embryo that was implanted. If the embryo implants, the clump of cells at the bottom will become the fetus and the cells along the edge will become the placenta. The little cells popping out at the top are the embryo starting to hatch from its shell. It has to hatch to implant so this is a good sign. The whole procedure lasted maybe 10 minutes, and was slightly uncomfortable, but not painful. It was very reassuring to have Mike with me, holding my hand. If we can't make a baby the "normal" way, then at least we could be together for this. This picture is hard to make out, but the little white dot above the cursor is the droplet of fluid containing our embryo inside my uterus. Hurray! So now we wait. I have to call tomorrow and schedule two blood pregnancy tests two weeks from now. I'm sure it will be a long two weeks with lots of false and/or real symptoms, but what is two more weeks when it has taken us two years to get to this point.